The State of Chhattisgarh is known as rice bowl of India and follows a rich tradition of food culture .The Food preparation falls in different categories . Most of the traditional and tribe foods are made by rice and rice flour , curd(number of veg kadis) and variety of leaves like lal bhaji,chech bhaji ,kohda , bohar bhaji. Badi and Bijori are optional food categories also Gulgula ,pidiya ,dhoodh fara,balooshahi ,khurmi falls in sweet categories. It is a traditional food of chhattisgarh ,which is now days rarely prepared in urban and rural houses.This chhattisgarh dish is prepared with raw wheat and jaggery .You have to boil the wheat in water with jaggery till jaggery syrup will completely enter inside wheat .Then wait till temperature comes down .Once it is cold enough then serve. Ghughari is a lost Indian traditional recipe which gives energy and increase blood in body..
1. For this Chhattisgarh traditional Food, heat 2-3 tablespoon of oil in a pan and crackle some cumin seed in it. Add 1/2 table spoons of salt,coriander powder,turmeric powder and chili powder. 2. Add 2 big cups of water and leave it for some time to reach its boiling point. Once water starts boiling add 1 big bowl of gram flour in it and stirs the mixture well, so lump formation can be avoided. 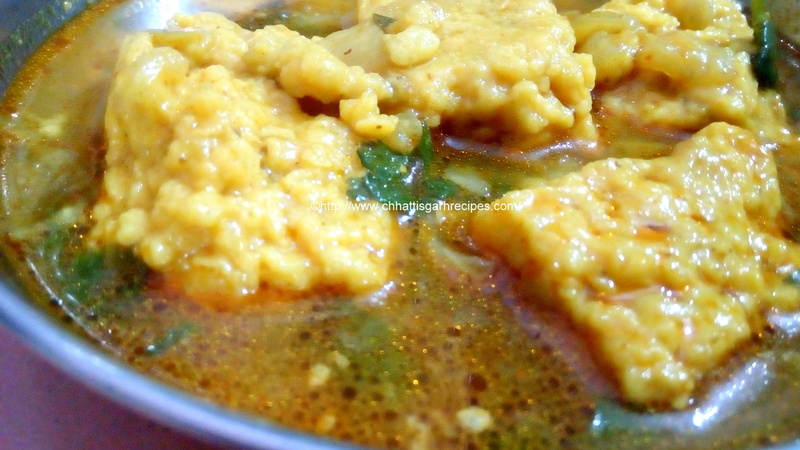 After 5-7 minutes you will see that water has evaporated and a concentrated paste of gram flour is ready to prepare Patori3. 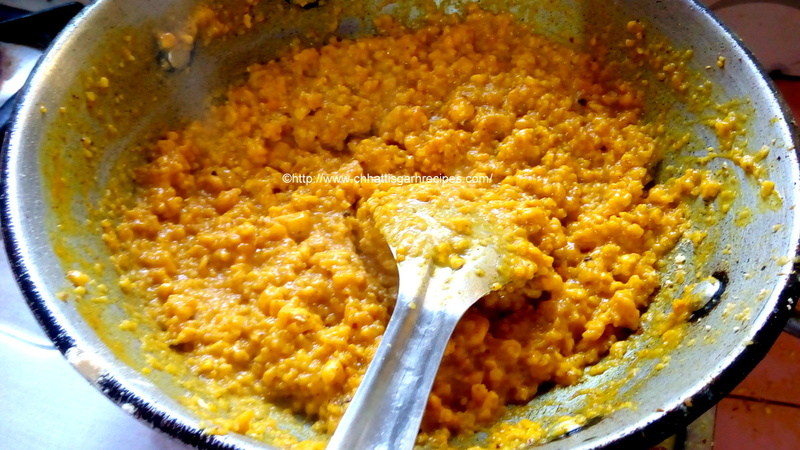 3 .Spread few drops of oil evenly on a plate and transfer the gram flour paste in it (plate) and slowly spread it ,leave the paste to get cold and settel. 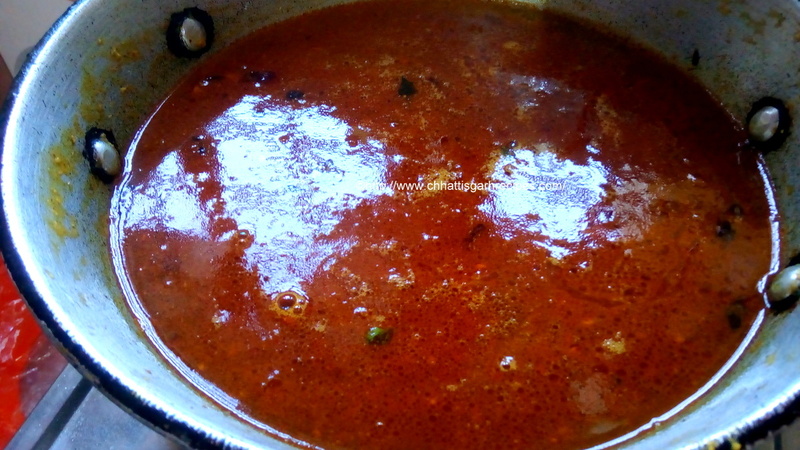 4 .Meanwhile pour some water in the same pan ,where gram flour paste remains are still stuck and boil the water again.This hot water we can use as gravy later. 6. take a 2-3 table spoon of oil in the pan and heat it . 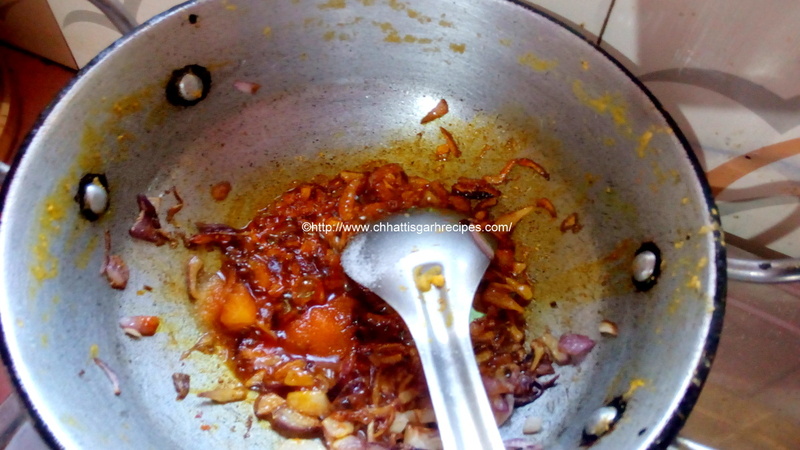 Add chopped onion ,1/2 table spoon ginger garlic paste (optional) and cook it till onion turns golden brown . Now add chopped tomatoes (optional) and cook for 2 minutes. Add salt, turmeric powder, chili powder, coriander powder and mix them well and leave it to cook for few more minutes again . 7.Once you find the mixture is cooked then add that hot water, which we had prepared earlier and let it boil for some time. 8. 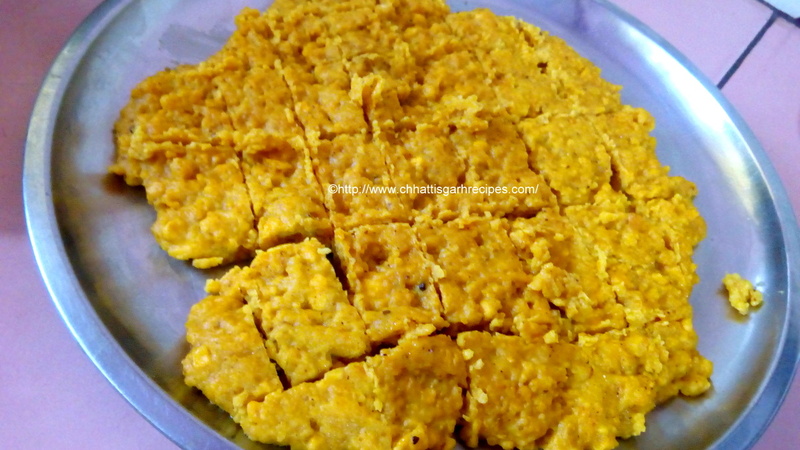 By this time, gram flour paste must have got settle on the plate, cut it into the diamond or square pieces. Add these pieces in the boiling water and cover the lid. 9. Let the mixture boil thoroughly, open the lid and add some fresh chopped coriander leaves. Cook it again for some time. Traditional dish patori is ready to serve. Do you have any question/query related to Chhattisgarh Recipes? © Madhu Kiran Soni. All Rights Reserved. No Part of this Blog can be copied or reproduced in any format without any prior approval.